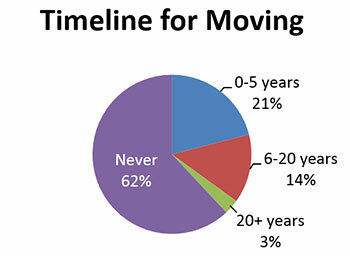 Current homeowners – by a wide margin – say they plan to never move. A new survey by Bankrate found 21 percent of homeowners plan to move within five years, but a whopping 62 percent say they plan to stay put. The Bankrate survey also revealed a strong preference for remodeling or upgrading in the next five years, rather than moving. Only 19 percent indicated they plan to move into a new home in the next five years, while 35 percent said they plan to remodel or upgrade their home. Supply continues to dwindle across the country, according to the National Association of REALTORS®, which reported total housing inventory dropped 7.2 percent from a year ago. The shortage is contributing to rising home prices. House hunters also face higher mortgage rates, noted NAR Chief Economist Lawrence Yun. With limited options to trade up, homeowners are turning to remodeling to satisfy changing needs. More than half (55 percent) of homeowners who participated in the 2018 Home Renovation Trend Report plan to undertake at least one project in the coming year. Kitchen remodels topped the list with 15 percent planning upgrades, followed by improvements a bathroom (13 percent) and a bedroom (9 percent). Homeowners are expected to spend nearly $340 billion on planned repairs and renovations during 2018. “Majority of homeowners plan to remodel, not move.” NW REporter. NWMLS. June 2018.